Imagine the new, hit, three-act play, San Clemente. In the act about culture, there’s a scene about art. It includes an inspirational environment: great weather, attractive beaches, wonderful people, and, among other qualities, momentous sunsets. It’s got plenty of performers; the numbers and talent of local artists abound. It’s increasing the number of performances with art shows, exhibits, classes and workshops. The backstage workers – the teachers of art, printmakers picture framers, serigraphers, art product sellers and art dealers - are, for the most part, busy helping the scene happen. Patrons of the visual arts are growing, perhaps not fast enough for those in the art community, who rate our art scene a two to three, a bona fide art colony being a 10. Dave Donaldson (right), owner of BeachFire showcases original art in his downtown restaurant. 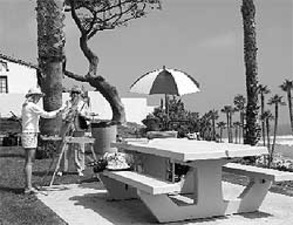 Interviewees suggested numerous models for a future San Clemente Art Colony. They included such Southern California communities as Laguna Beach, La Jolla, Balboa Island (Newport Beach), the art districts in Santa Ana and Orange, and several Los Angeles art pockets. Further north, they noted Santa Barbara, Carmel, San Luis Obispo, Cambria, Carmel and Marin City and County, which has a very active Arts Council that creates and brands that area as an Arts Community. In other states, Taos and Santa Fe, NM, were mentioned, as well as Ogunquit, Maine; Provincetown Mass; Jackson Hole, WY; Sedona and Scottsdale, AZ; and Austin, Texas. However, they collectively agreed that our City would become a model in itself, embracing the talents and skills of an already existing cadre of productive artists. The greatest assets San Clemente already possesses in its forward-thrusted journey towards art colony status are artists. Artists in many different media, professional artists who not only show their creative efforts in San Clemente, but in the Laguna Pageant of the Masters, in art galleries throughout California, and even in European markets. As well as the school children and beginners who turn to art as a creative outlet. There are so many, Patti Herdell, co-owner, with husband Richard, of the popular San Clemente Art Supply suggests, “ You can’t throw a rock in San Clemente and not hit an artist – not that you’d ever want to. It just illustrates the point that almost everyone here either does some form of art, or knows or is related to an artist.” She estimates that over 1500 customers, artists from five years to older adult, from hobbyist to professional, are among her clients. The question of educating our community’s artists is answered by a broad array of opportunities. SC Art Supply currently offers thirteen different classes for both children and adults beginning at the introductory level to “Color Theory in Oils,” as well as four workshops in life drawing, animation, airbrushing, and pastel portraits. The facility also hosts four Saddleback College Emeritus classes for seniors. Mary Von Lortz instructs all ages in painting and drawing landscapes, seascapes, florals, still lives, and portraits in her Sidestreet Studio. The City’s Recreation Department sponsors a class for kids, “Paint, Paste, and Pour,” and four adult classes in Japanese floral design, stained glass, woodcarving, and watercolor. The San Clemente Arts Association has guest art presenters at its monthly meetings and sponsors workshops for its 300 members. Many of our City’s artists provide individual and small group art lessons in their homes, studios, or available school classrooms. The Laguna College of Art and Design has a number of San Clementeans enrolled, and Rick Delanty and his colleagues at San Clemente High School and art aficionado teachers in our middle and elementary schools continue to introduce and encourage their students to appreciate and practice art. The Frame House is #4 on the Artwalks. Where is art available? Works of art – originals, prints, lithographs, crafts, serigraphs, giclee, and framing are sold in numerous locations. Included are galleries, framing stores, artist studios, and, increasingly, restaurants. On Del Mar, the largest “art gallery” in San Clemente is BeachFire Bar & Grill, where owner Dave Donaldson exhibits some eclectic 300 products of local artists for his patrons. Madi and Mac’s children’s store exhibits Sean O’Daniel’s animal surfer painting. WAS Associates Art Galleries shows Corinne Schminke’s work exclusively. 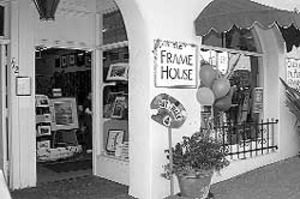 The Frame House, in business in San Clemente for almost 40 years, features local artists’ originals and reproductions with a San Clemente theme, and has over 80 print catalogs. The two-year old San Clemente Fine Arts Gallery, owned by Delta Farrington, specializes in local professional originals, vintage paintings and antique prints. Present Tense is primarily a craft gallery. In its Community Center Gallery, the SC Art Association continuously changes its exhibits between judged contests and the revolving exhibits of its member’s works. On El Camino, Antoine’s features oils by Fred Hope and JK Art and Design Gallery displays the work of owner Jason Kuncas with his colorful dashing recreations of exotic island scenes and foreign lands. San Clemente Art Supply rents its facilities for individual artist’s shows. In the Old City Plaza, there is an Italian ceramics shop, a photography portrait and a photography gallery. Elsewhere, Michaels and Aaron Brothers feature prints and framing, Modern artists Elizabeth Laul Healey exhibits at the Lundegaard Gallery (formerly Mary McMenamin’s gallery), and in Talega, the Art N’Frame sells prints. Rick Delanty showing his artwork to Stephanie Dorey. Talega’s brand new Artistic Gift Gallery intends to invite local artists to display general art and local scenes. Oil painter Tom Swimm has a gallery in Rancho San Clemente. And, Art is displayed at the Vine Restaurant, Iva Lee’s, Stewart Surfboards, One World Smoke Shop, Ocean Minded, the Department of Motor Vehicles, and City Hall. info@sanclementegalleries.com (Fred Hope), www.artJK.com (Jason Kuncas), and TomSwimmfinearts.com (Tom Swimm). For framing, besides Aaron Brothers, Michaels, and Art N’Frame, more specialized work is done by the Frame House, Studio 2087, Timothy’s and Talon. There are also numerous special events and opportunities for local residents and tourists to view art in San Clemente. The Art Walk, launched last May, invited patrons into twelve art-selling establishments. 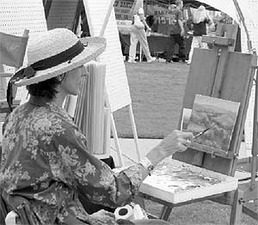 The annual Plein Aire “Paint San Clemente” competition of the Art Association draws artists from outside the area. 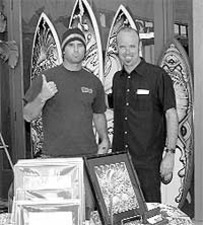 Other city events such as the Ocean Festival, The Fiesta, the Sea Fest, and the monthly Sunday Del Mar art and craft street fairs cater to a tourist/retail clientele usually looking for inexpensive works rather than new and sophisticated pieces. Painting Al Fresco the historic pier. The Casa’s three galleries have already hosted rotating exhibits from the Huntington Library and the California Native Plant Society, as well as work by several local artists… and the Casa plans to host an annual art show featuring professional artists from the community. For youth, it will host a youth showcase of quality art produced by local high school students. San Clemente’s art scene is still abornin’. With the help, vision and leadership of President George Gooch, the Art Association is continuously increasing its membership, providing funding for art-related activities for schools, as well as scholarships to top art students. Artists like Rick Delanty, Fred Hope, and Mary McMenamin, are dedicated to raising the City’s art bar. And people in businesses, such as Patti and Richard Herdell, who anticipate expanding their location for art shows, classes, and studios, along with many other contributors, are all supporting the arts, making a bright future for San Clemente’s art scene look even brighter.